University Steven Knapp and outgoing Board of Trustees Chairman Russell Ramsey spearheaded the decade-long strategic plan, which will begin its implementation phase next year. The Board of Trustees unanimously approved the nearly $400 million strategic plan Friday — a blueprint that the University will use to reshape its undergraduate structure starting next year. The far-reaching plan, stretching the University’s priorities around the world and across research disciplines over the next decade, will strip away the burdensome process of transferring between GW’s colleges by next academic year. Currently, students must apply to a different college through the admissions office, and are not always given the green light. “I want to encourage students to take risks and be able to make changes. And I don’t want what you told an admissions officer when you were 17 in high school to be a barrier to you taking risks,” said Senior Vice Provost for Academic Affairs and Planning Forrest Maltzman. That will be one piece of the new admissions model outlined in the plan, which calls for high school students to apply to to the University as a whole rather than to specific colleges and will likely be implemented within two years. 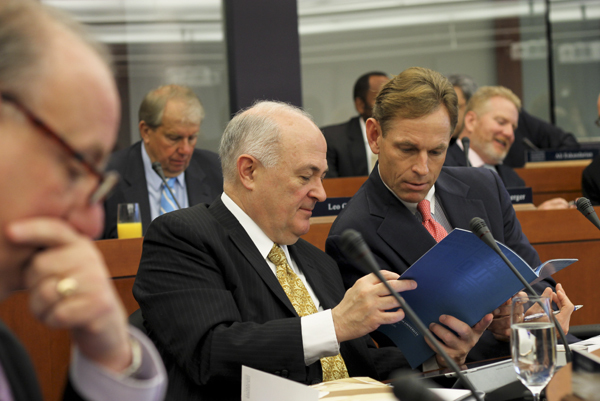 The move drew criticism from some colleges — like the Elliott School of International Affairs — last fall for potentially weakening their brands and chipping away at the influence of GW’s individual schools. These changes are also part of an administrative push for students and faculty to dip into different academic disciplines and link together more curricula. The plan calls for $30 million worth of new interdisciplinary research centers, like those underway that will combine statistical analysis of big data with fields like genomics and engineering. The University will also put aside $50 million to $100 million for new faculty who study in multiple fields. Faculty leaders and administrators will also begin to create a core curriculum next year, implementing new GW-wide classes similar to the University Writing model. Lerman said top administrators in his office and on the Faculty Senate educational policy committee will discuss the changes next year. “We can do this without having a different core curriculum, but I think it would miss a real opportunity to have a conversation with the faculty as a whole about what every GW student should learn and every GW student should know how to do, independent of school,” Lerman said Friday after the plan was approved. To lead students through these changes, the University will train academic advisers to guide students through interdisciplinary courses. Maltzman said he hopes administrators will re-engineer DegreeMAP, an online tool where students can track their progress toward graduation requirements, to be more conducive to students taking courses in different schools. Lerman and Faculty Senate executive committee chair Scheherazade Rehman will work with groups of administrators, faculty and students next year to help implement the rest of the plan. GW’s different colleges will also create their own strategic plans as they adjust their agendas to fit the University’s goals. The plan includes a wide range of other initiatives to take shape over the next 10 years, like doubling the number of international students, improving performing arts venues and loosening GW’s ban on classified research. Overall, the strategic plan could cost up to $400 million for the University. Mike Morsberger, vice president for development and alumni relations, said he has begun planning small dinners for the fall with alumni, parents and grateful patients of GW Hospital who are likely to contribute larger donations. In 2014 or 2015, the University will roll out a comprehensive fundraising campaign, which will, in part, finance the strategic plan, though administrators have not established a fundraising goal. The University will also turn to the Innovation Task Force, a group formed by Knapp in 2009 to mark $60 million per year in savings and new revenue for the University. About $5.2 million will come from the ITF annually for the 10-year plan.